On April 25, 2015, Iju Shakya was on the third floor of her home in Katmandu getting ready to go visit her grandmother when the doors slammed shut, a bookcase crashed to the ground and everything shook. A magnitude 7.8 earthquake had just hit Nepal. Amazingly, Shakya, her parents and her house escaped relatively unscathed, but she was horrified by the devastation wrought by the earthquake, which killed about 9,000 people, injured many thousands more, and damaged or destroyed more than 600,000 structures. Shakya, who was back in Nepal visiting her parents after graduating with a bachelor's degree in biology from Smith College in Massachusetts, immediately began raising money on Facebook, which she supplemented with personal savings. With support from her parents, Shakya then worked with priests, community leaders, a local organization and residents to construct two temporary shelters for those whose homes were damaged, repair 47 small temples and distribute more than 200 care packages that included medicines and personal hygiene items. But through the course of doing this work, she noticed some people in the community were not pitching in to rebuild. That got her thinking about how to encourage people to take more ownership and initiative in such situations. Her solution was to launch The Investing in People Education Support Fund. The fund awards $100 to 10th grade students who describe a problem in their community and then outline and implement a solution that can alleviate that problem within a few months. 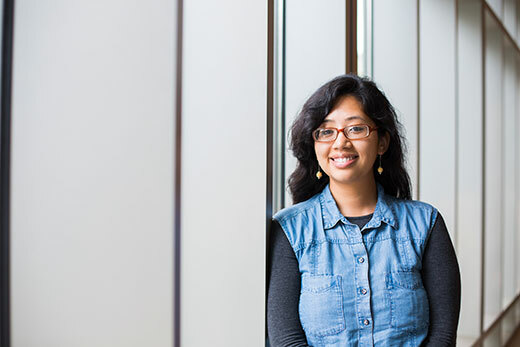 Before the earthquake, Shakya had been planning to pursue a career in public health, but her plans were more focused towards infectious diseases research. After the work she did in the wake of the earthquake, she became passionate about working with the community to understand their health needs and to do work that caters to those needs. At Emory's Rollins School of Public Health, she found that opportunity. In addition to pursing a degree in global health and working in a Rollins Earn and Learn position as a graduate research assistant at the Food Fortification Initiative, Shakya carved out time to take up community-centered work. Specifically, she helped establish and coordinate a community and academic coalition to address the high prevalence of diabetes in the South Asian community in Atlanta. The Atlanta South Asian Health Alliance is the brainchild of Megha K. Shah, a family physician researcher in the School of Medicine, and Shakya served a project coordinator. Shakya, with her team's support, recruited an alliance of Bangladeshi people with diabetes, family members, imams, community leaders and clinicians to delve into why diabetes strikes this group at such a high rate, to develop research questions that were of interest to them, and to brainstorm culturally appropriate interventions. Shakya, whose master's research focused on implementation of mother support group programs in Sri Lanka, has not finalized her plans for after graduation, but she hopes to do community-driven public health work in South Asia. She also continues to work with Nepalese students through her Investing in People Education Support Fund, for which she recently was awarded a Humanitarian Award at Emory's Student Involvement and Leadership Awards.